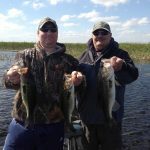 I was working today on Lake Okeechobee for Bass Online. We were fishing artificial baits and the FISH won. Only 6 fish were caught today in the tough conditions. The wind forecast for was 15-25 mph out of the WNW.